Wigan give Shaun Wane the perfect send-off at Old Trafford. 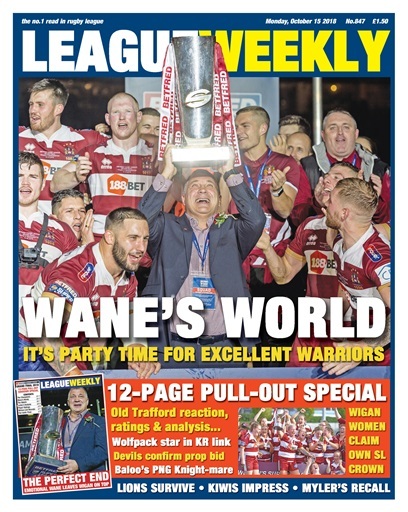 Relive all the action with our unmissable 12-page souvenir pull-out special - includes reaction from both camps, expert analysis from Danny Lockwood, Dave Hadfield's tribute to Shaun Wane and the best action shots from the Theatre of Dreams. 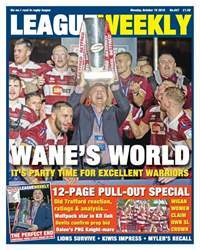 Plus there's news on the World Club Challenge front while Steve Price vows Warrington will be back 'bigger and better'. Wigan's women made it a delightful double for the Warriors while back in the men's game Swinton secure survival with victory over Workington. Andrew Voss anticipates a brilliant autumn of test rugby after the Kiwis' impressive win over Australia ... read how they did it, and go inside the England camp with Jermaine McGillvary and Elliott Whitehead, plus Knights coach Paul Anderson.